ACCA is committed to supporting you throughout your studies. 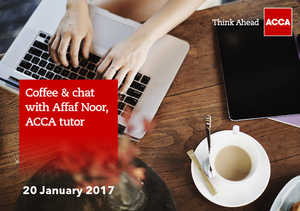 We would be delighted if you could join us for our free online coffee and chat session with highly successful ACCA tutor Affaf Noor. Mrs Affaf Noor is an ACCA member and certified internal auditor from IIA-USA. She trained with Ernst & Young and has been teaching and conducting training for over 10 years. Mrs Noor has also taught at Kaplan Financial London and at a platinum ACCA learning provider, in Pakistan. Mrs Noor will be on hand to field any of your exam related queries. We are sure you would benefit from her informal engagement style, her knowledge of ACCA exams and her tips on exam techniques. She will be sharing the secrets of exam success of thousands of students who have been trained and taught by her. So make yourself a coffee and join her plus your fellow students for this unique opportunity! You will also have an opportunity to ask questions on ACCA exams from ACCA education experts working in Emerging Markets, including Dr Afra Sajjad, Head of Education and New Market Development – Emerging Markets. To secure your place please REGISTER NOW. We will then send you joining instructions for the session.